Target added $200 eBay gift card! They have been selling $25, $50, and $100 for quite a while. 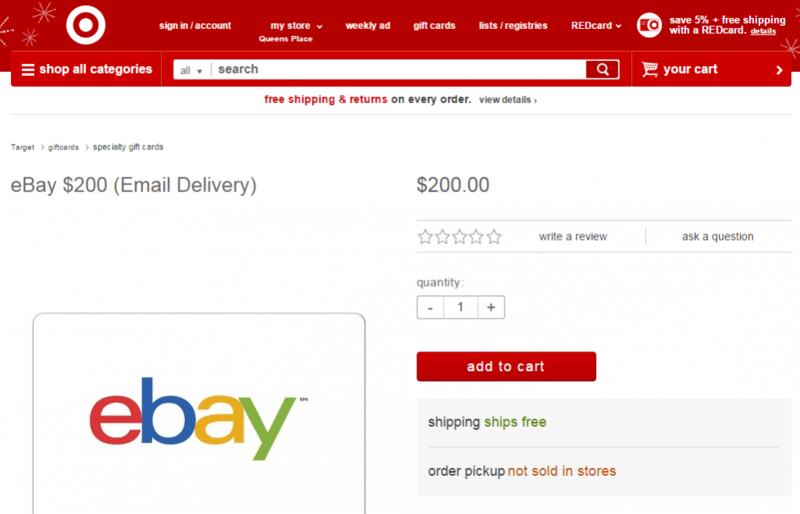 Now, $200 is the highest denomination available at Target.com. The limit is the same as other denominations, three ($200*3=$600) per day. In my experience, the higher denomination gift cards are, the better, easier, and less stressful regarding eBay gift cards, especially when redeeming them. If you used eBay gift cards before, you might have the same problem. Sometimes, they won’t take multiple gift cards. Say you have four gift cards and want to use them all for eBay purchase. A total balance of four gift cards would completely cover the amount of the purchase. You apply one by one. GC#1, #2, #3 has been applied without problem. But, after you apply GC#4, GC#1-3 are erased. Even if you try to re-apply GC#1, it won’t take it anymore. An error message in a red letter says, “This coupon or code (xxxx) is invalid. You’re not able to use it with this payment.” However, if you remove GC#4, GC#1-3 come back again. Sometimes, I can apply as many as seven gift cards. Sometimes, I can’t apply as few as two gift cards. It just happens at random. The problem has nothing to do with the $5000-limit of redemption in 180 days. If you change an order you apply those gift cards, it may be successful. If you log out and in again, it may work, too. But, anyway, it’s very frustrating. If you have a single gift card that has enough balance to cover, you won’t have the problem. The gift card will have some remaining balance, but you can use it for the next purchase with another large amount of gift card. In my experience, the fewer gift cards you use, the more unlikely the problem happens. Bestbuy.com also sell eBay gift cards, but it’s only $25. I never bought from Best Buy, but probably shopping portal sites won’t pay cash back for GC purchases at bestbuy.com. If you have credit cards that offer bonus rewards for electric stores purchase such as Citi Dividend (Q4 category) or US Bank Cash+, you can earn 5% cash back. And Best buy gives 2% back in bestbuy’s reward. When you consider all of them, you might as well get 7% off eBay gift card, but remember that many $25 GCs may be going to give you the problem many times. Staples.com has the same $200 eBay gift card. And if you have Chase ink or Amex SimplyCash, you can get 5% or 5x reward for purchases at office supply stores. It’s the same deal as eBay GC purchase with Target REDcard at Target. However, category bonus of ink or SimplyCash has the limit (apply to purchases up to$25,000 or $50,000 per year) while Target REDcard’s 5% discount is unlimited! Plus, with one trick at checkout, it’s possible to get 3 to 5% more discount at Target.com. I found some very useful info on your blog and am quite curious what trick you are using to get an extra 3-5% cashback. It might be possible to split pay for GC at target, but how would you earn 3-5%? What cc pays that rate for target.com? Feel free to email if you don’t wish for it to be public. I have already written a post about it before, and a l!nk is on this post. Where is there a link?